With the Tour de France well under way cycling is the sport of the week! 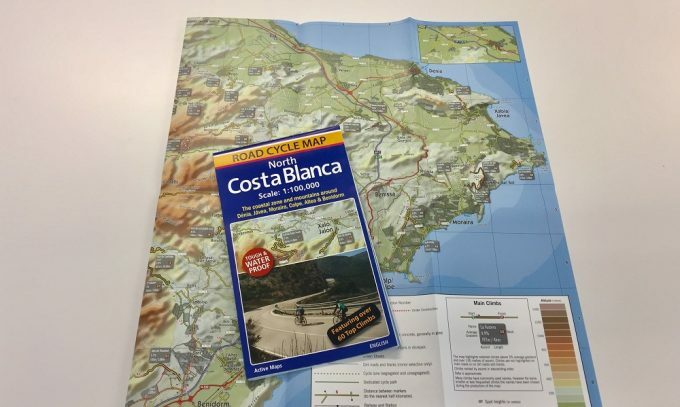 We’ve just produced this excellent Road Cycle Map of North Costa Blanca, Spain for Active Maps. Active Maps are a mapping company who specialize in producing powerful, clear and attractive maps. The maps are for specific user groups, publishers, local government, as well as any other interested organisations. The Map is printed on Polyart, one of our favourite special stocks. Polyart is a versatile, tear-proof and tough synthetic paper which is used for many outdoor projects and is perfect for map printing. There are several weights of Polyart, this particular project was printed on 110gsm A2 on our litho Heidelberg press and then folded to make the 20pp fold down map. Polyart can be creased, folded, die-cut and laminated and is shower proof. If by the remotest chance you get stuck in the rain in Spain – your map wont dissolve to pulp but will keep you on the right road! Having had the pleasure of spending a week in Moraira in June 2018 I can say with first hand experience that it is a beautiful part of Spain and one that is popular with cyclists and tourists alike. If you would like to find out more about Polyart and its superb longevity characteristics then visit the Kingfisher Press website here. Polyart Digital – Coming soon !! Historically Polyart has only been available to print Litho but we have just begun testing a new version of Polyart on our High Definition Digital Jetpress 720s. This could mean short run colour maps printed on Polyart will be available soon! Follow our blog to keep up to date with the latest news. If you would like to find out more about Kingfisher Press please visit the Kingfisher Press website here.